Taking place from January 28 - 30, the Superyacht Design Symposium returned to Kitzbühel, Austria for the 2018 edition, bringing together some of the world's finest design minds from both inside and outside the yachting industry. Click through to catch up on all the action from the event and see the highlights with our video above. 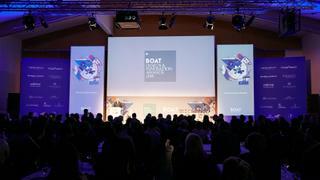 Boat International Media would like to thank event partners Videoworks, Oceanco, Design Centre Chelsea Harbour, Clyde & Co and Sabrina Monte-Carlo and Mountain Lodge partner Dynamiq for their support. 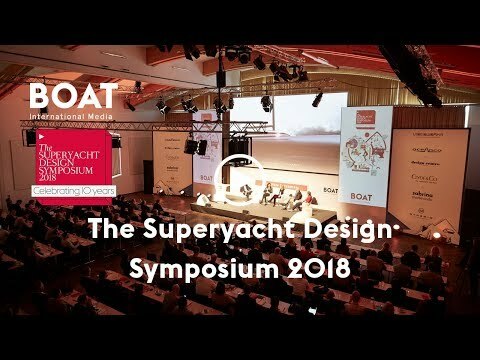 Taking place from January 28 - 30, the Superyacht Design Symposium returned to Kitzbühel, Austria for the 2018 edition, bringing together some of the world's finest design minds from both inside and outside the yachting industry. Click through to catch up on all the action from the event and see the highlights with our video above. Boat International Media would like to thank event partners Videoworks, Oceanco, Design Centre Chelsea Harbour, Clyde & Co and Sabrina Monte-Carlo and Mountain Lodge partner Dynamiq for their support. 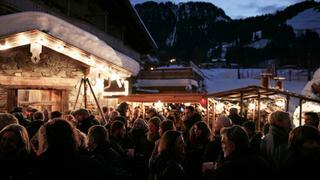 The Superyacht Design Symposium 2018 kicked off in traditional style with welcome drinks at the Streifalm alpine bar in the centre of Kitzbühel. Paola Trifirò, owner of 33 metre sailing yacht Ribelle, with Boat International's Luca Vasile, Alberto Galassi, CEO of Ferretti Group and chairman of CRN and Thomas Haffa. Guillaume Rolland, head of yacht design at Christian Liaigre, at the Superyacht Design Symposium 2018 welcome drinks. 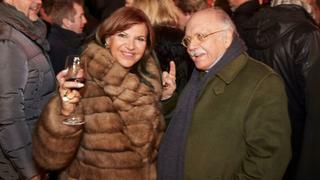 Elena Bonelli and Gianni Zuccon. Sunday rounded off with the inaugural Boat International Design & Innovation Awards (formerly the ShowBoats Design Awards) which recognised the talent and hard work of the design teams that have produced some of 2017's most astonishing yachts. 19 awards were handed out, including a lifetime achievement award for Giovanni Zuccon and two Young Designer of the Year Awards in association with Oceanco, with sponsorship provided by Dynamiq, Metrica, Decca Luxe, Azimut Yachts, Clyde & Co, Custom Line, Leonardo Helicopters, Puiforcat, Videoworks and Sabrina Monte-Carlo, as well as Judges Commendation Awards sponsored by DKT Artworks. . 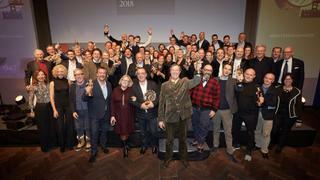 The 2018 award winners pose for a photo at the Design & Innovation Awards - see the full list of winners here. The Superyacht Design Symposium saw a range of inspiring talks, interviews, workshops and panels spread across two days. 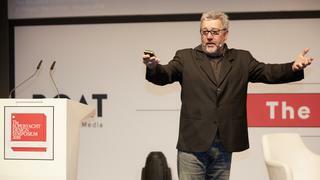 Day one began with a highly anticipated keynote speech from Philippe Starck (pictured above) - listen again by downloading the SDS 2018 podcasts. 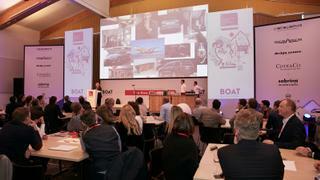 The Superyacht Design Symposium 2018 once again saw many delegates participate in the highly competitive Design Challenge. This year's task asked the designers to refit an icebreaker explorer yacht - see the results in the May 2018 edition of Boat International. 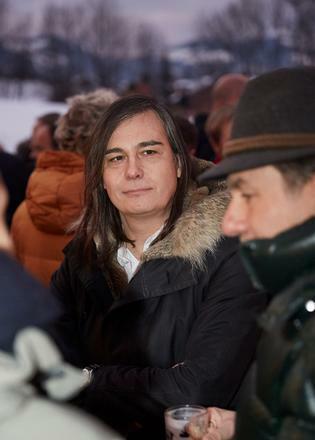 Always a highlight of the Superyacht Design Symposium, the Mountain Lodge party took place on Monday evening at Restaurant Hochkitzbühel, in association with Dynamiq and sponsored by Decca Luxe. 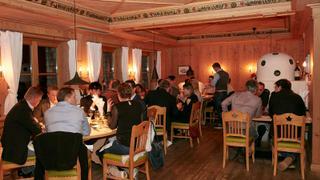 After enjoying drinks on the cable car ride up to the restaurant, guests sat down to a traditional Austrian feast before festivities began in earnest. 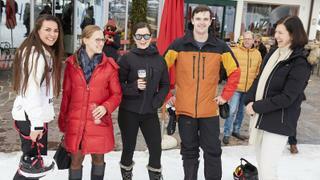 It would be remiss to spend time in the beautiful mountains around Kitzbühel without actually hitting the slopes. As ever, the end of the Superyacht Design Symposium was celebrated with the highly contended Ski Cup which was this year battled out on the famous Hahnenkamm run. 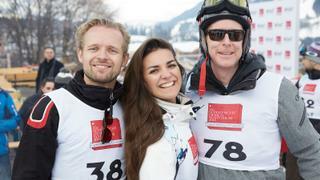 Sebastien Vibe-Petersen, owner of Parsifal III and Q, with Michaela Listova of Lasvit and Mike Reeves of Claydon Reeves. Michaela Listova, Laura Gnotke, Daisy D’Isernia, Alex Gibbs and guest. Mike Reeves, Pascale Raymond and guest.